This painting probably belongs to a series of half-length capriccio portraits of women for Elizabeth Petrovna, Empress of Russia on which Tiepolo was working in late 1760. This distinctive Venetian genre of poetic or fantasy portraits derives from Giorgione, and Tiepolo (celebrated as a latter-day Veronese) often looked to 16th-century Venetian art. Such images of beautiful women are often categorised as courtesans. 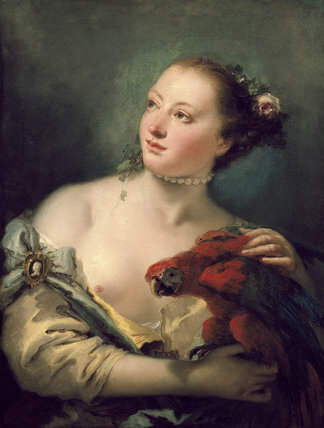 Exotic birds are common in Tiepolo's work and here the macaw provides a colourful and witty motif. The cameo portrait shows one of the Caesars, possibly Augustus. Lorenzo Tiepolo made a pastel copy of this work (National Gallery of Art, Washington), together with a pendant showing a woman in a fur wrap Allegory of Winter, Kress Collection, El Paso Museum) which may record a lost oil painting. A drawing with variations after the painting probably by Lorenzo is in the Ashmolean.